Day four, New Year's Eve day, was the day of the classic Golden Circle tour. 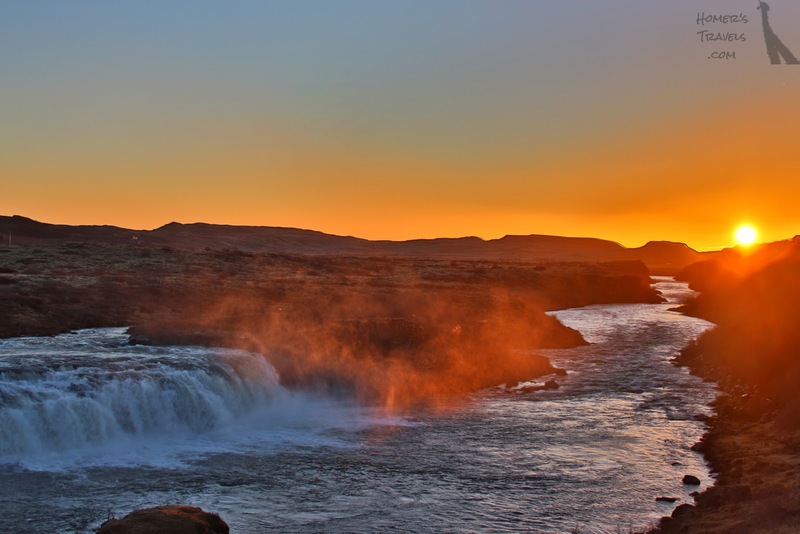 The tour would involve a national park, waterfalls, and geysers. 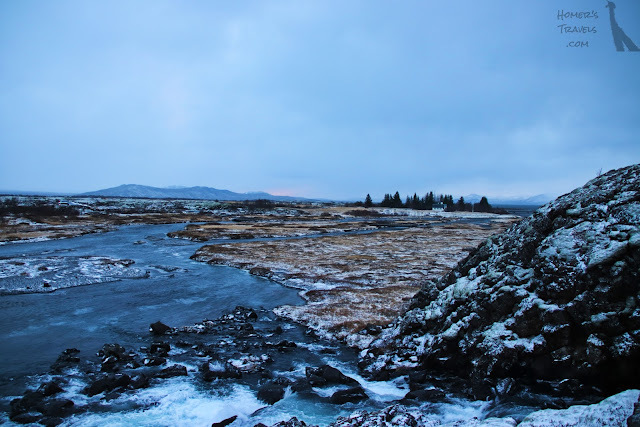 The eight hour tour started at Þingvellir (Thingvellir) National Park. The mid-atlantic ridge where, in the north Atlantic, the North American and the Eurasian tectonic plates come together, runs right through Iceland. This active fault line is the source of Iceland's volcanic, earthquake, and geothermal activity The ridge is spreading by 2 cm (0.78 inches) per year and will eventually split the island in two. The far ridge is on the Eurasian plate. A glacier fed river separates the two plates. Our first stop was on the North American plate side where we viewed a plane between two ridges - one on the North American plate and the other on the Eurasian plate. The tour guide said we were going to walk a one mile trail down to a lower parking lot. It was cold, windy, and a bit icy and apparently the park was not advising people to hike the path. This message did not get to us before, after checking out the gift shop, we headed down the trail. The trail took you by rocky cliffs, small water falls, and the edge of a river. The river between the plates from the trail. When we got down to the lower parking lot we waited for the bus. I was wondering where everyone was when the guide showed up. Only eight people decided to walk the trail. It was slick in spots but not that terrible in my opinion. Back on the bus we drove across the official fault line that separated the plates (nothing really spectacular there) and headed to our next destination: Gullfoss. 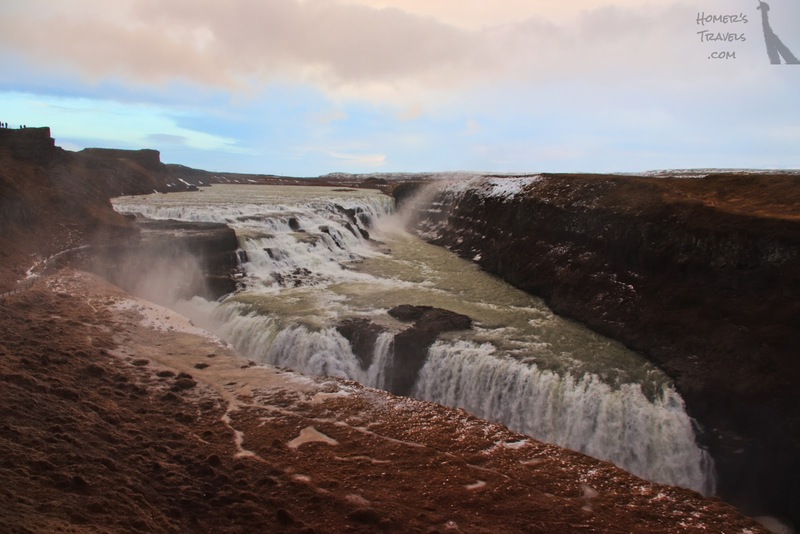 Gullfoss is a rather impressive waterfall (foss means waterfall in icelandic). The path down from the visitor's center took you to several vantage points, each giving you a different view of the falls. After seeing Niagara and Iguazu falls, Gullfoss is not that big but it is grand on its own merits (yes, I know, I've become a natural wonder snob). Note: back home the Wife was watching Vikings on the History channel and we realized one scene was filmed at Gullfoss. The steamy hot water over the geyser pools. The Sun decided to join us today. We ate lunch at the visitor's center before heading for our next destination for the day: Geysir. 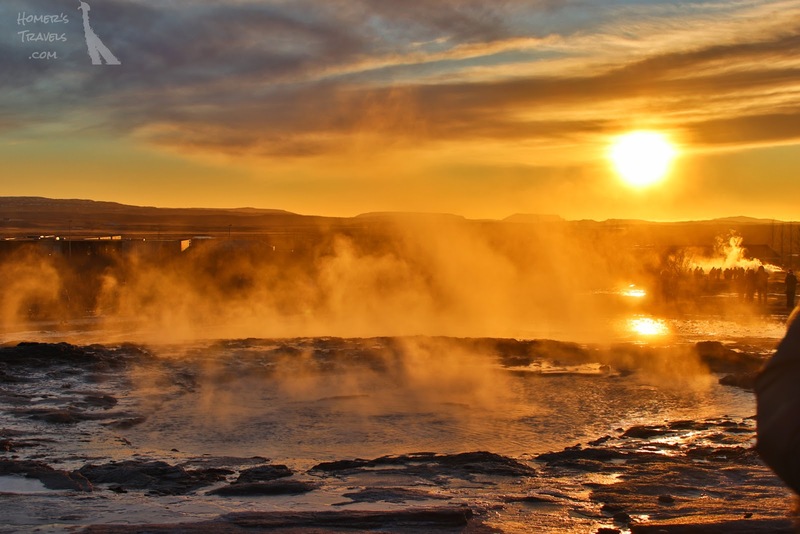 Geysir is one of the first geysers observed by Europeans. 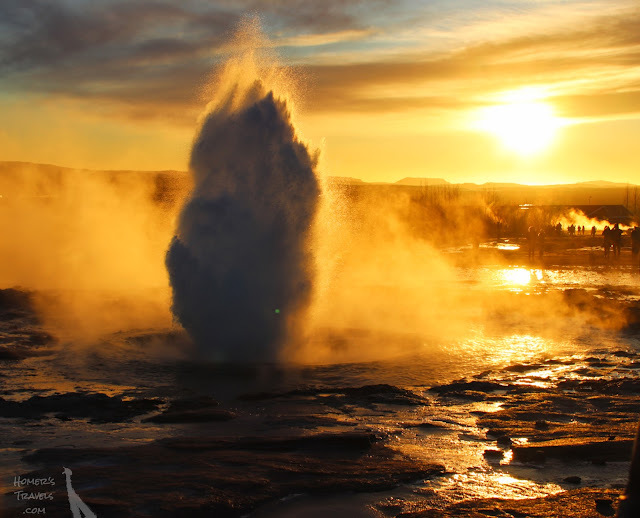 The namesake Geysir is now off limits and has been dormant since the early twentieth century. It was often induced to erupt but it appears they no longer do this due to environmental concerns. Fortunately for us the Strokkur geyser does erupt periodically and we saw it erupt a couple times while we were there. To make it even better the sun came out from behind some clouds to backlight the eruption. After capturing the picture we went to the visitor's center for a snack and a little shopping before getting back on the bus to our next stop: Faxafoss. Faxafoss is a small waterfalls with a salmon ladder. It was normally not on the tour but the guide decided to throw it in as a bonus. It was not the most impressive but I did get a nice picture in the area. Faxafoss to the left and the Sun on the horizon. Our official last stop of the day was the oldest church in Iceland: Skálholt Cathedral. 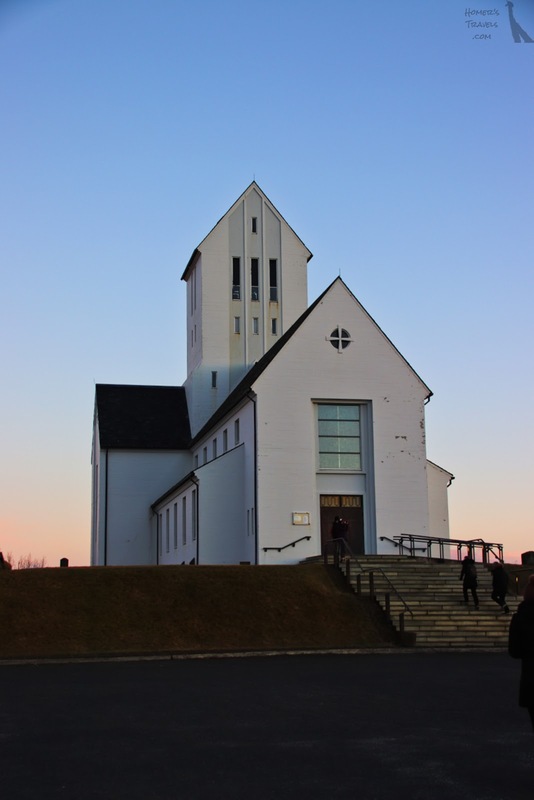 The church, founded in 1056, was an important religious center on Iceland. The church was replaced nine times before being refurbished in 1956. In the basement of the church were old relics from the older churches and a 'secret' tunnel that took you back outside. On the way back to Reykjavik we tried to stop at a restaurant for a snack but it was closed (the tour guide was told it would be open New Year's Eve). We then drove in front of a large geothermal plant that generates electricity for the city. It was closed too, of course. We spent a couple hours watching BBC strangeness until it got closer to midnight. Icelanders are famous for their ruckus fireworks at midnight on New Year's Eve. We'd planned to walk to Hallgrimskirkja church which was supposed to be one of the epicenters of the fireworks but a friendly shopkeeper we'd chatted up had said it was often very crowded there. I was tired and I think I was having trouble adjusting to the time change due to the lack of real Sun. 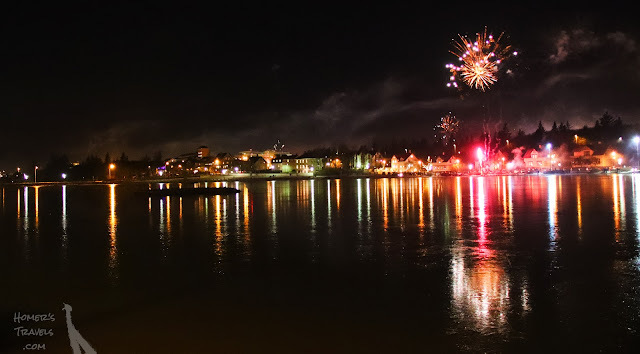 Instead we walked down to the lake next to the city hall to watch. Fireworks over the lake. The sky became smoky really quickly. You can see and hear a short video of the fireworks here. We were not disappointed. There were fireworks everywhere. While there were some coming from the direction of Hallgrimskirkja there were apparently more being shot off from the Catholic church. It reminded me of the fireworks shot off in Guatemala. There was a general thunder of explosions and smoke everywhere. There were also quite a few drones flying around, each marked by a bright red light. People are known to shoot off fireworks into the crowd. One was set off not too far from us. The Whooping Swans that call the lake home were not happy at all. This had been a good day. The Sun coming out and glimpses of blue sky helped a lot. We returned to our hotel room and fell asleep to the continued popping and booming of the New Year's celebration.